2. The min. desired inlet mass flowrate is only used for pre-calculations. Its absolute value is the min. value you should insert above in “inlet mass flow rate”. Second it is used for “Autosegmentation”. 5. It is the sensible energy demand, heating(-), cooling(+) WITHOUT supply air conditioning. For further detailed information I recommend the Manual 05-MultizoneBuilding.pdf. You can find it in …\Trnsys17\Documentation\ or …\Trnsys18\Documentation\. As I am trying to perform simulations of the single room with ceiling heating system, I would have some questions regarding the values definition of the Active Layer window, presented below. 1. What is the meaning of the "gain" value? 2. When I am performing the simulation in TRSYS with different "min. desired inlet mass flowrate" values, I got the same results (for example, I changed the specific value from 20 to 50 and the room temperature curve remains the same). Thus, what does the value represent? How is it connected with "inlet mass flow rate" value? 3. 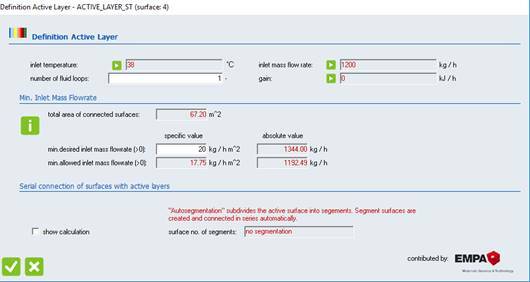 In the active layer definition, I put the inlet temperature and mass flow rate numbers. However, how is it possible to obtain the outlet temperature of the heating system? 4. How can I measure the value of the surface temperature of the ceiling? 5. What does the Qsens represent in more details? If there is a document where I could get more information of the aforementioned values description, please let me know.